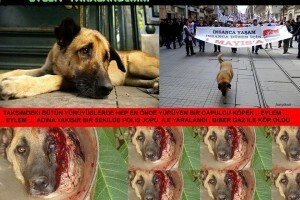 The protestors did not only help each other but also to the animal. 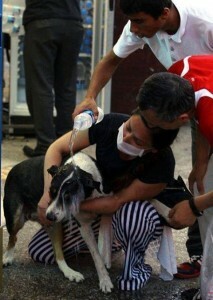 Here is a dog affected by the teargas. Taksim, Istanbul, 2013. Source unknown. 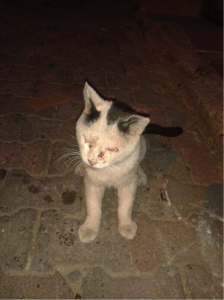 One of the tens of cats that cannot open their eyes, due to the teargas. Cihangir, Istanbul, 2013. Source unknown. 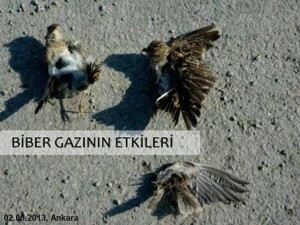 Birds affected by the teargas. Ankara, 2013. Source unknown. This photograph is from the symbol of Ankara Kuğulu Park (The Park with Swans). 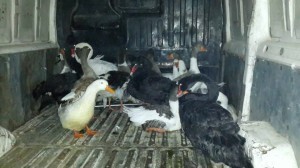 The swans had to be removed as they were affected by the teargas. Çankaya, Ankara, 2013. Source unknown. 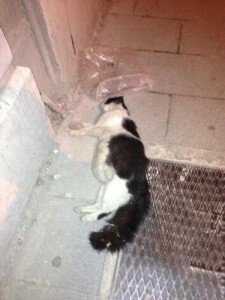 Many street dogs have been affected by the teargas. Here two protestors are helping a dog. Taksim, Istanbul, 2013. Source unknown. 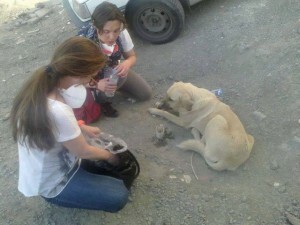 Two protestors trying to help the dog that affected by the teargas. 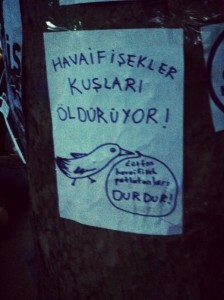 Istanbul, 2013. Source unknown. 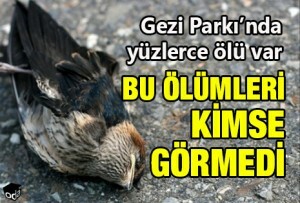 Costless veterinary and food service for the animals at Gezi Park. Taksim, Istanbul, 2013. Source unknown. 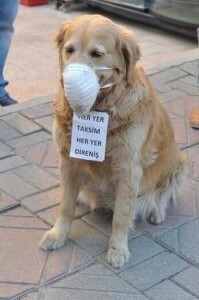 A dog at the protests with a gas mask. Istanbul, 2013. Source unknown. 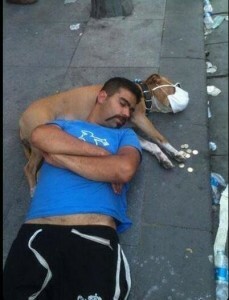 Two friends that are resting after the demonstrations. Taksim, Istanbul, 2013. Source unknown. 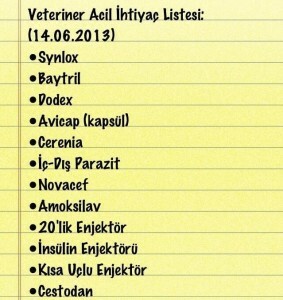 An emergency list for the Veterinary Tent at Gezi Park. Taksim, Istanbul, 2013. Source unknown. “Fireworks kill the birds”. Taksim, Istanbul, 2013. Source unknown. 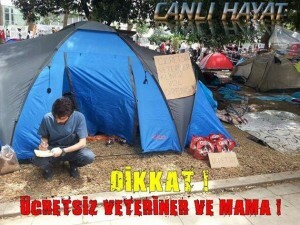 A volunteer veterinary student at the Veterinary Tent at Gezi Park. Taksim, Istanbul, 2013. Source unknown. 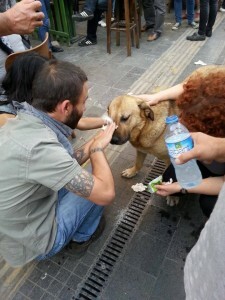 A dog helping the protestors cleaning the environment after the police attacks. Taksim, Istanbul, 2013. 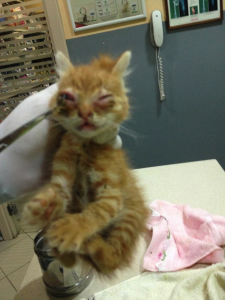 This entry was posted in Aggrieved Animals on 23 June 2013 .